Mubarak has terminal cancer and is pumped up by drugs for public appearances. the Washington Times reports. Will the peace pact survive? Egyptian President Hosni Mubarak’s cancer is terminal and he will die within a year, according to intelligence sources quoted by the Washington Times. Western diplomats are worried whether the 1979 peace treaty with Israel will survive. Both countries retain diplomatic embassies and exchanges, but the "cold peace" has been increasingly chilly. 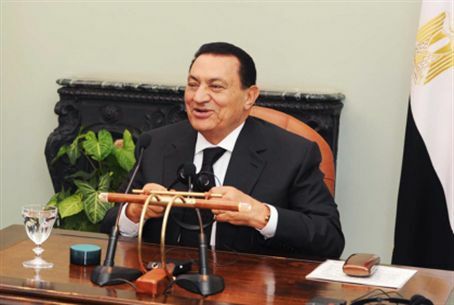 Egyptian authorities have previously denied Israeli and foreign media reports that Mubarak has cancer. It is known that he has traveled to Germany and France for medical care, but the Times report indicates his condition is a lot worse than it seems. The Egyptian president has confounded the rumors by appearing vibrant and alert in recent meetings with Prime Minister Binyamin Netanyahu and U.S. Middle East envoy George Mitchell, among others. Cook said the public appearances are made possible by drugs, and explained, "I heard that they pump him up with something that makes him able to function, so he can do these meetings and go to these public events." Mubarak took power in 1981 following the assassination of Anwar Sadat by terrorists linked with the radical Muslim Brotherhood, Egypt’s largest opposition party and which is officially outlawed. Mubarak has run a tight regime, using an emergency law that effectively silences political competitors. His likely successors are either his son Gamal, who has displayed strong skills in economic reforms, Egyptian intelligence chief Omar Suleiman, or Mohamed ElBaradei, the former chief of the International Atomic Energy Agency (IAEA). Martin Kramer, a scholar at the Jerusalem-based Shalem Center and an analyst on Egypt, however, told the Times that he thinks the peace treaty with Israel and Egypt would survive Hosni Mubarak’s death. "Egypt has kept the peace deal with Israel through the wars with Lebanon and through intifadas," Mr. Kramer said. Mubarak and Saudi Arabia King Abdullah recently were described as “aging autocrats” by The Economist of Britain. Mubarak is 82, and the king is 86. “Decades of repression have ensured that the opposition is quiescent in Egypt and virtually inaudible in Saudi Arabia, but they have also made these countries vulnerable to violent disruption,” according to the magazine. Noting the instability that often accompanies transition in non-democratic countries, The Economist warned that Western interests will be in danger over security and energy if the countries do not accomplish a smooth succession. It pointed out that the only stab at democracy in the Arab League has been in Lebanon, which has been divided by civil war and near-civil war for two decades. It added that Iraq is mired in corruption. The Palestinian Authority’s American-sponsored democratic elections resulted in a victory by Hamas terrorists that left the United States in shock and has ended up with the PA running a government that is not legal because it has unilaterally postponed elections for fear of another Hamas victory. “The closed political systems of Egypt and Saudi Arabia, the uncertainties of dynastic power-mongering and the corruption inherent in patronage-ridden autocracies still often lead to plotting at the top and frustration that could spill over into anger at the bottom,” The Economist warned. “That becomes more likely as the Internet, mobile phones and easier travel make people far less easy to control."